The human immunodeficiency virus (HIV) is often likened to a hermetically sealed tin can no one has yet been able to break open. Now, researchers at the University of Montreal have identified a way to use a ‘can- opener’ to force the virus to open up and expose its vulnerable parts, allowing the immune system cells to then kill the infected cells. This breakthrough, published in the journal Proceedings of the National Academy of Sciences, opens a new path in the fight against HIV and could ultimately lead to the design of a vaccine to prevent transmission of the virus. This innovative approach could also be part of the solution for one day eradicating the virus. Despite recent advances, 35 million people are infected with HIV-1 worldwide. The current study found that people infected with the HIV-1 virus have naturally occurring antibodies that have the potential to kill the infected cells. The researchers just had to give these antigens a little push by adding a tiny molecule that acts as a can opener to force the viral envelope. It was in this way vulnerable regions were exposed and recognized by the antibodies to form a bridge with some cells of the immune system, initiating an attack. In a previous study from the team data finding showed that the serum of patients infected with HIV-1 facilitated the elimination of infected cells when two proteins specific to the virus, Nef and Vpu, were deactivated by gene mutation. The experiments were conducted with serum samples from the AIDS and Infectious Diseases Network (SIDA-MI) cohort of the Fonds de recherche en santé du Québec (FRSQ). However, wild-type HIV-1 virus, responsible for the vast majority of infections in the world, still contains these proteins, which act like bodyguards. So the team set out to outwit them. They achieved this by adding a tiny molecule to the cell surfaces of infected patients, called JP-III-48, which imitates a protein called CD4. CD4 proteins are located at the surface of T lymphocytes and allow immune system cells to be infected by HIV. The researchers explain that the virus has to get rid of the CD4 proteins to protect itself. Adding the small molecule forces the viral envelop to open, like a flower. The antibodies that are naturally present after the infection can then target the infected cells so they are killed by the immune system. 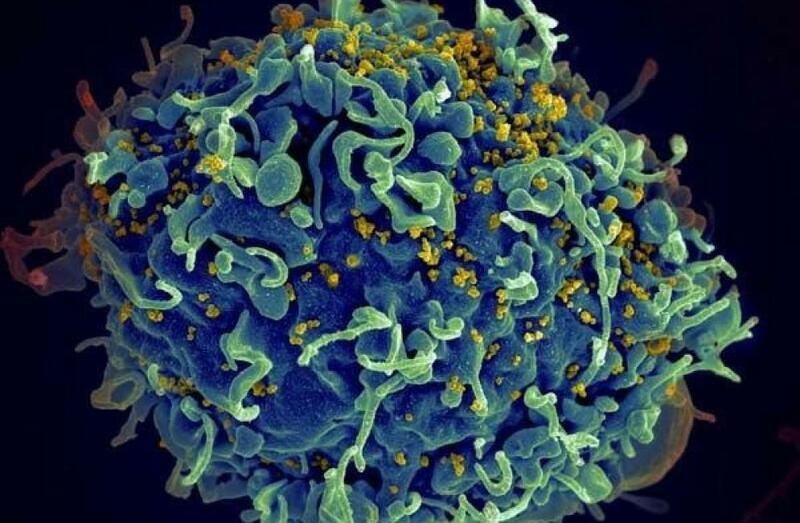 The JP-III-48 molecule was developed by researchers at Harvard University and the University of Pennsylvania; however, the current study is the first time it has been successfully tested on patients infected with HIV. For decades, scientists have been trying to devise a vaccine to block HIV infection, which causes AIDS. Antiretroviral drugs can slow the spread of the virus, but it remains hidden dormant in cells and returns when the treatments cease. These are called HIV ‘reservoirs.’ The team hypothesize that the solution is to develop a ‘shock and kill’ therapy by reactivating HIV reservoirs to force the virus out of its hiding place, then kill the infected cells with this molecule and the already present antibodies. The discovery by the team could help develop a two-part vaccine to prevent HIV infection, through antibodies that are easy to generate and using this new family of molecules. The team surmise that this discovery opens the way for the development of strategies to eliminate the viral reservoirs of individuals already infected. The next step is to test the potential of this can-opener molecule in monkeys. Scanning electron micrograph of HIV particles infecting a human T cell. If the human immunodeficiency virus (HIV) is a bit like a hermetically sealed tin can no one has yet been able to break open, the good news is that researchers at the CHUM Research Centre, affiliated with the University of Montreal, have identified a way to use a “can opener” to force the virus to open up and to expose its vulnerable parts, allowing the immune system cells to then kill the infected cells. Credit: NIAID/NIH.